This poll was released after the GOP convention, but taken before the convention. Usually candidates see a rise in poll numbers after their own conventions, so the real support for Baker is probably a little more positive today. The real problem for Patrick is his job approval numbers, just 34% positive and 49% negative, exactly the same as his overall support numbers. Patrick can only climb up from 34% by either improving his job approval number, which is unlikely so late in the term, and with looming budget cuts likely to leave many voters unhappy. Or he has to convince voters who largely disapprove of his performance that he is the lesser of three evils. Baker is in a much better position – 63% of voters have never heard of , or have no opinion about Baker. Only 13% have an unafavorable view. So all that Baker has to do is to get his name out, and form a positive opinion of himself among these voters. Cahill is in the middle – 45% have either never heard of him or have no opinion, and 32% of voters have a favorable opinion and 18% unfavorable. So he has a lot of room to grow as well. By a margin of two to one, 60% to 30%, voters said that the state is on the wrong track as opposed to heading in the right direction. The percentage saying that the state is on the wrong track has increased by 10 percentage points since November 2008, the last time the Polling Institute included the measure in a statewide survey. If the legislature passes local aid cuts, and there are teacher layoffs across the state, this number of likely to get much, much worse. It will be difficult for Patrick to raise his favorability in time. He’s going to have to try to reach voters who have no opinion on Baker and turn them against him, before Baker can reach them first. I expect this campaign to get increasingly negative very soon. Having Mihos drop out of the race is a big strategic advantage for Patrick. Instead of Mihos and Baker fighting it out all summer, increasing each other’s negatives, Baker can now focus on Cahill and Patrick. Patrick’s poll numbers are definitely nothing to crow about, but he seems to be getting the message, reaching out more to constituents and pressing for reforms. I don’t doubt he would be in BIG trouble if this were a two-way race. But thanks to the Tea Party and Tim Cahill, Patrick could pull this out. Maybe. I’m not a big fan of any of these candidates yet. 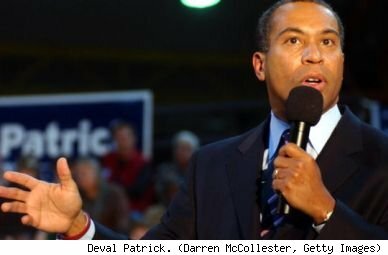 I voted for Deval last time – because he seemed like he was really going to listen to the people. He had that issues web site where people could post what they thought the governor should work on. But then he didn’t act on anything on that list. It really bothered me. I felt like I had been tricked. And he really hasn’t been able to stand up to the legislature which is completely out of control. I wish he had done more to protect local aid last year. And he’s not doing enough about it now. Plus he promised to do something about Shared Parenting, which is the #1 issue on his web site, and hasn’t done anything. Its a pretty important issue to me because I know a lot of families who are affected by it. I agree that the race is too early to make predictions about it now – but I think Patrick is definitely in the weakest position, and Baker the strongest. Have you checked out Jill Stein’s campaign at all? Regardless of what you think about the Green-Rainbow Party, she’s the only candidate that’s trying to build the type of independent, electoral alternative we need in order to wrest control back from the lobbyists and insiders. A lot of what held her back in 2002 was the spoiler argument, and a clear attempt on the part of the establishment to keep her out of as many debates as possible. But this year the spoiler argument can be laughed off the stage, since they’re all clearly taking votes from each other. And it will be hard for them to keep Stein out of the debates, though I’m sure they’ll try. Check out http://www.jillstein.org if you want a serious candidate for these serious times.